Visit zoho.com/one and sign up for a 30-day trial. A setup wizard will guide you through verifying your domain, turning on applications, and adding users. If you're not sure how to set up your account immediately, you can always make changes later. If you have lots of users to add, you can save time by importing a spreadsheet with their names and email, or by syncing their data from your Active Directory. If a new user's email is hosted under your verified domain, then you can set their initial password and choose whether or not they'll receive a notification email. Otherwise, they'll be sent an invitation and have to choose their own password. After adding users, you may choose which applications they'll have access to and what their permissions will be. After you finish evaluating Zoho One, log in and click Upgrade in the upper right corner to pay for your subscription. Visit zoho.com/one and sign up for a 30-day trial. Do not cancel any of your existing Zoho accounts. When you switch to Zoho One, all the data and settings in your existing accounts will remain intact. Exception: If you are not the admin of your organization's Zoho Campaigns account, you will need to ask your account's admin to downgrade to the free edition before signing up for Zoho One. A setup wizard will guide you through verifying your domain, turning on applications, and adding users. During your trial you may only connect data from existing Zoho CRM, Zoho SalesIQ, or Zoho finance apps to your Zoho One account. If you add more users to your Zoho One account and their emails are hosted under your verified domain, then you can set their initial password and choose whether or not they'll receive a notification email. Otherwise, they'll be sent an invitation and have to choose their own password. After upgrading to the paid version of Zoho One, you may connect any of your other existing Zoho apps. If you are an admin of the application, you may connect it to Zoho One by yourself. Otherwise, you will have to add the app in Zoho One, select one of its admins, and click Request access. Don't try to use every app, especially when you're getting started. Try picking two or three that you're most interested in, and make sure they're bringing you value before adding more. It's tempting to try every app out the moment you sign up. We recommend mastering one app or suite of apps before moving on to the next. Zoho One is priced at a point that makes software a utility, not a luxury. Even if you're using only a couple applications, you'll still be getting your money's worth. Call our concierge team to get advice on which applications you should use. This won't be a sales call; our concierge team will ask about your business and recommend how you should get started. To get the best advice, please be prepared to explain what you do, which tools you use currently, and what you're looking to get out of your software. We recommend signing up for one of our webinars covering broad topics like marketing, sales, and accounting. You'll find out which apps apply most to your business, where to find more resources about them, and get your questions answered by Zoho experts. If you prefer sorting things out in person, see if we have any upcoming events in a city near you. You can always hire a Zoho partner to consult and help you implement Zoho One for your organization. Migrating is the process of moving your data or settings from one application to another. Below, we've linked to help docs explaining how some of the most popular migrations to Zoho work. Even though these help docs are specific to individual Zoho applications, the same steps apply for Zoho One users. 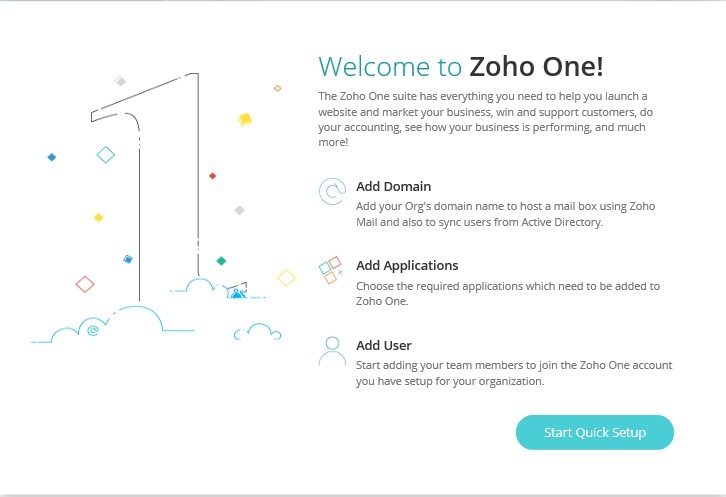 When people hear that Zoho One is the only suite they need to run their whole business, sometimes they wonder if they'll have to give up a trusted application that they've been using for years. Our answer: Of course not! Most Zoho applications offer third-party integrations that make it easy to integrate with your existing apps. If you want to keep using an app that doesn't have a pre-made integration, you might be able to build the integration yourself using Zoho Flow. If you've ever tried running your business using software from several vendors, you've probably experienced how complicated it is to figure out who has access to what, how to update permissions, and what the ROI will be for deploying apps to more employees. When you sign up for Zoho One, most of that complexity goes away because you get access to a centralized admin panel. The admin panel lets you manage all your users, applications, permissions, and security settings from one place so you won't have to wonder who has access to what. Since adding extra applications won't cost any more, you never have to worry about rationing your software. The admin panel lets you choose which applications to turn on for your organization and who will have access to them. Employees who log on to one.zoho.com will see icons of all the applications that have been turned on for them. When you click on an application that's been deployed, you'll see everyone who has access to it and what type of user they are. When you click on a user in the admin panel, you'll see which applications they have access to, their application permissions, which groups they belong to, and other information like the last time the signed on. Each application may have slightly different methods for organizing and labelling permissions. You don't have to learn how permissions work for every app because you can assign service admins who act as administrators for specific applications. You can also add Zoho One admins that act as administrators for your whole account. Write to support@zohoone.com to reach the Zoho One support team. Otherwise, you can usually reach the support team for a specific application by clicking on your profile picture or the question mark icon in the upper right corner of your screen.